Pup roll off trailers are a key way to increase productivity by carrying two roll off boxes at one time. Here at BENLEE we have a pup roll off trailer in stock to meet your needs. Call us at 734-722-8100 and we can discuss the type of pup trailer you may need. We even stock them for same day shipment or pick up. 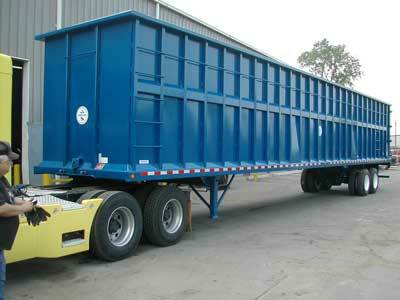 Of course we make a every type of roll off trailer you need, but also call us for scrap, open top trailers. Roll off trailer parts are important to keep your unit on the road. We start with the best and we stock the best for replacement-Parker Tough Cover 3,000 lb. hydraulic hoses. Others roll off trailer manufacturers use 2,000 lb. hoses. We make 3,000 lb. hoses standard to you get higher up time. Parker’s 482TC hose offers a synthetic rubber inner tube that provides wide fluid compatibility. ½ minimum bend radius for ease of routing. Provides 80x abrasion resistance compared with standard rubber covered hose. Meets 100R1 specification. 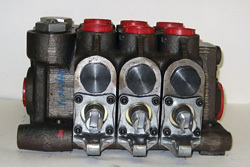 Gresen Valves, in our case the V40 are at the heart of our units. Yes the are expensive, but they put up with the tough environment and pressures that our customers put their equipment through. Gresen now owned by Parker is available globally, so service parts are easy to get anywhere. When is comes to BENLEE we use the best of the best, Gresen! V40. We make the best roll off trailers. Our roll off trailers use the best systems! 80,000 GVW is the Federal Maximum total weight for trailers in almost all states. Michigan and New York are the main states that with special permits you can haul more. At times other states allow exemptions. 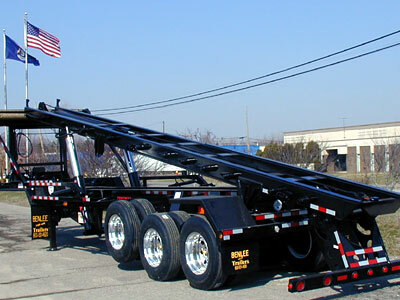 Michigan of course allows 6, 7 and 8 axle trailers with GVW of close to 140,000 lbs. and NY allows an annual permit of about 102,000 lbs., but as said most all others are 80,000 lbs. Conventional-Roll off Trailer-This model in a 40′ Tri axle (three axle) unit is the work horse of the BENLEE product line. Think of it as an M1 tank. It has the ability and it can pick up 100,000 lbs. which is totally illegal to do and it should never be done. It can be over permitted to do this. This unit weighs 22,000 lbs. Bridge Master Roll off Trailer-model is also 40′ and with two axles can also be 80,000 GVW. It is becoming the new standard in 80,000 GVW trailers. It can only pick up about 60,000 lbs., which is totally illegal and should never be done. This unit only weighs about 17,500lbs so it can carry much more weight than the conventional. Both great units, both BENLEE.